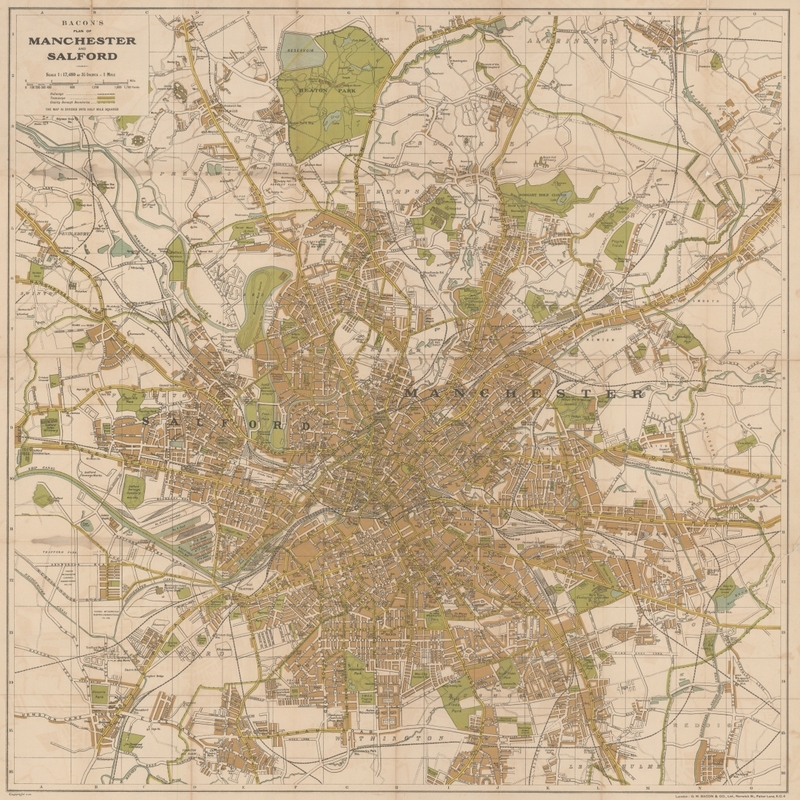 I have spent a good deal of time over the last couple of years looking at a wide array of maps of Manchester - old / new, pretty / ugly, useful / unworkable. 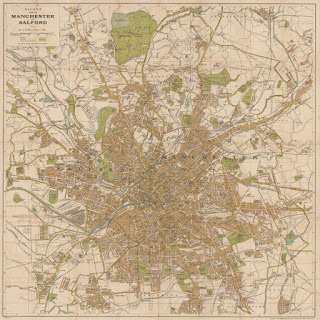 One of the most attractive and effective maps I've come across is this early twentieth century street map produced by the cartography company G.W. Bacon & Co. Ltd. The coverage of Bacon's Plan of Manchester and Salford feels just about right. Large enough to show most of the developed area but compact enough to be legible and easily usable as a sheet map. I really like the colour scheme, with its brown built up areas and green parks and recreation grounds. The symbol design is simple and clear, and the streets are well labelled. Overall, the aesthetic leads to harmonious cartography and one that really captures the scale and shape of the city that was at its peak in many senses. I have an original nicely framed and hanging on my kitchen wall. If you want to see this map in much greater detail I have also scanned it and put it online (warning its an 18 meg jpeg file). 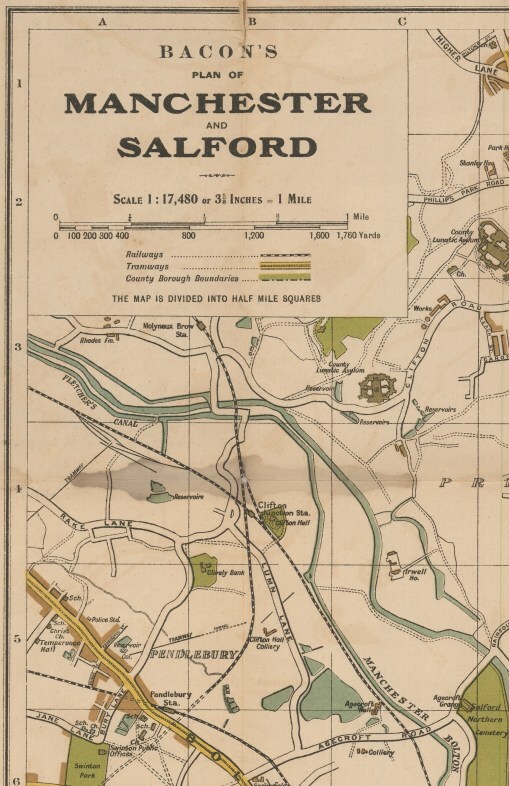 An earlier version of Bacon's Plan of Manchester and Salford, dated to 1907, from the Manchester City Library's Local Studies Collection has been digitised and can be browsed on Rylands Library Luna service. The cartographic design is quite similar but the extent of urbanisation is somewhat less. We put together a substantial catalogue to support our exhibition Infra_MANC: Post-war Infrastructures of Manchester that was on public display for a short spell in spring 2012. We printed 250 copies of the catalogue and these have now all been distributed or sold, so we have decided to make a digital version available as a free download. The two hundred and twenty page catalogue is stuffed full of illustrations, many of which we unearthed from the archives for the exhibition and have never been published before. The images above and below are typical page spreads from the catalogue. (The design and typesetting was all done by my collaborator Richard Brook.) The lengthy catalogue text provides a cultural narrative and technical history on four distinct infrastructures from the 1950s and 60s: the Mancunian Way motorway, the unbuilt Picc-Vic railway tunnel, the Guardian underground telephone exchange and the speculative designs for a city centre heliport.